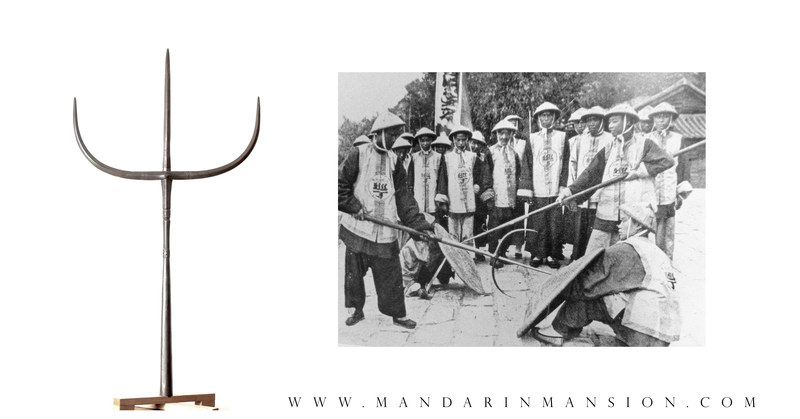 Chinese "tiger forks" or hǔchā (虎叉) are one of the classic weapons in Chinese martial arts. They were probably originally designed to fend off or kill large dangerous animals, like bear and tiger. It is hard to imagine today, but little over a century ago such animals were abundant in rural China and posed a real threat to local communities. Most villages had tiger traps and tiger squads to keep tigers well away from the village and protect its inhabitants. The tiger fork also made it to conventional martial arts use, to ward off that other potentially dangerous creature: humans. They are sometimes seen on old photographs in the hand of Chinese soldiers, militia, and guards in the retinue of an official. The weapon itself is heavy, but they would normally operate in teams with each its specific role. Its purpose in a group was probably either to prevent an opponent from reaching something that needed to be protected, or pinning the opponent down so that others could deal with him with other weapons. 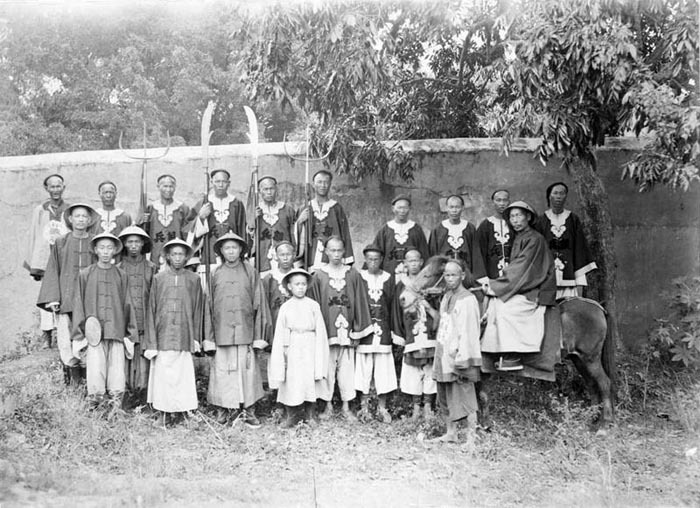 Qing soldiers at Xiamen, Fujian, in 1900. Two in the back carry large tiger forks. 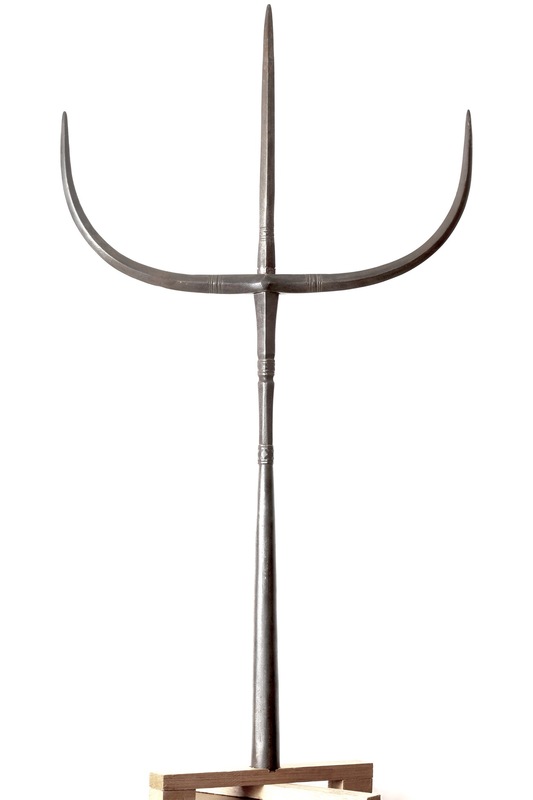 A massive Chinese hǔchā (虎叉) or "tiger fork". It has a socketed base that goes from a round cross-section to octagonal, and then flattened diamond at the base of a long spearhead. Here, a thick crossbar sweeps forward on both sides to form the additional two prongs. It's a take-down design: The crossbar can slide off the top, probably once held by a brass of iron washer to keep it in place. You can still see where it used to be peened in place. The whole is much larger than us usual for these, and very well-made. 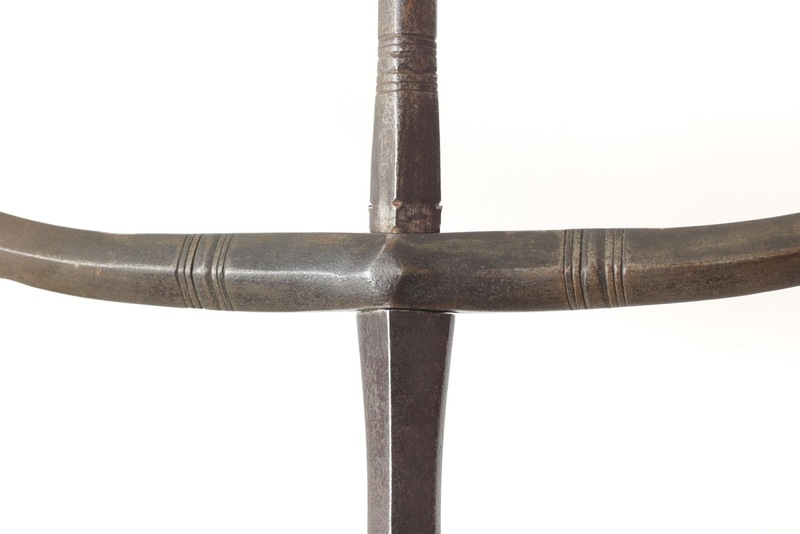 The substantial prongs have a flattened diamond cross-section and there are geometric, filed decorations on main spear and prongs. Such weapons are pretty hard to date. The general idea is that the better made, more substantial ones were made earlier, but this is not always the case. 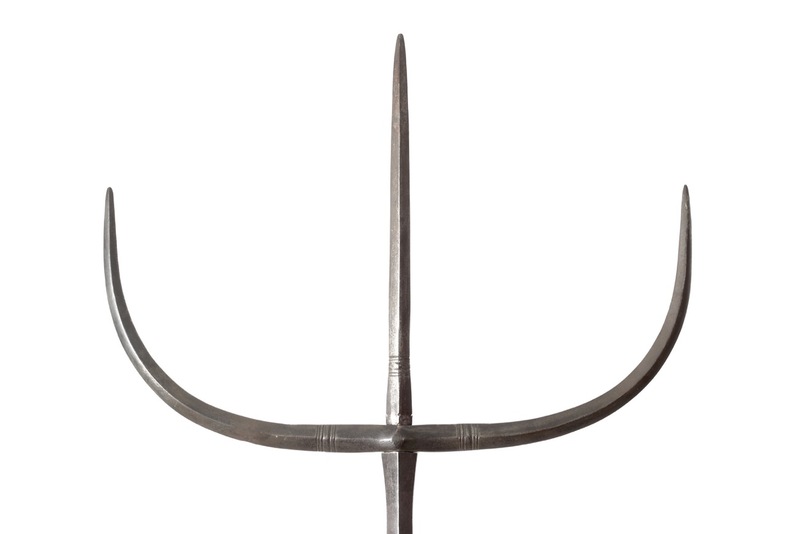 Although quality got rarer at the end of the dynasty, good quality weapons were still produced at the time. It's just that due to inflation and economic decline, less people could afford them. 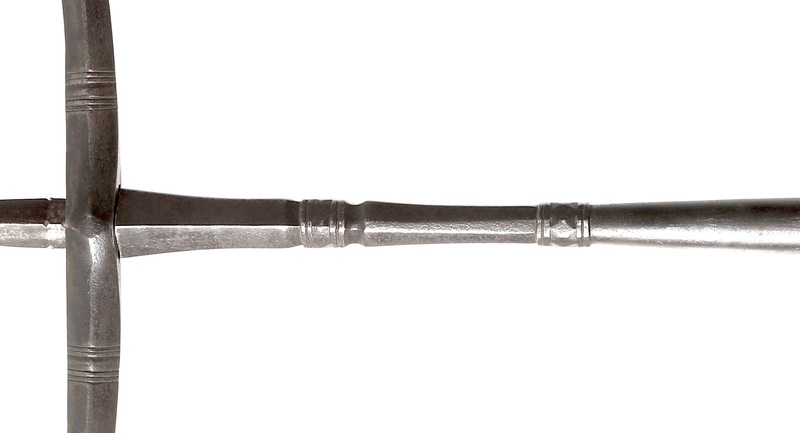 Therefore I think the tiger fork is probably made in the 18th or 19th century. Comes with a simple wooden cross-stand. A large and impressive tiger fork, in excellent condition and better made than most examples on the market. A tiger fork in the hands of Chinese soldiers. Their vests say xún dīng (巡丁) which means something like "patrol officer", possibly the guards of a Yamen. Late 19th century. Unknown photographer.